Lift to move rolling stock up & down, to & from the Waterloo and City line AKA "The Drain"
The Skylon in the process of being dismantled. Dome of Discovery being dismantled. I think you find, as your photograph shows, the "Jubilee" bridge is the modern rebuild of the passenger bridge alongside the railway bridge. 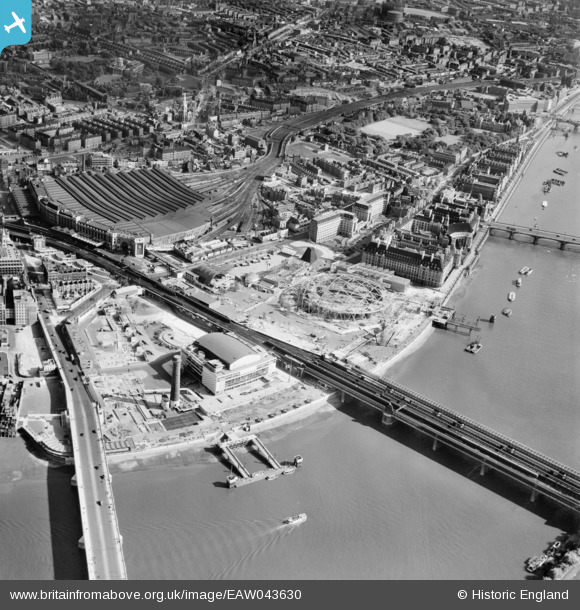 This is a photograph taken in 1950 you must remember, therefore no Jubilee bridge then! Sorry.